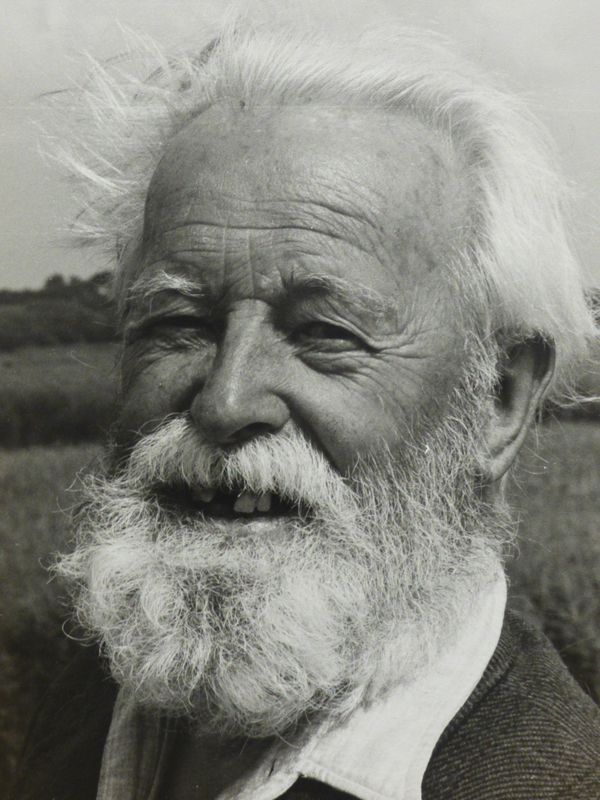 This week, as we look forward to spring, we highlight the work of a celebrated Hampshire naturalist. Dr Canning Suffern (1892-1978) made a significant contribution to ornithology in the county and is perhaps most famous for his association with the nature reserve at Titchfield Haven, near Fareham. His research papers, held in Special Collections, reflect his wide interests in the field of natural history, and include his scientific notes, records of observations and working papers. 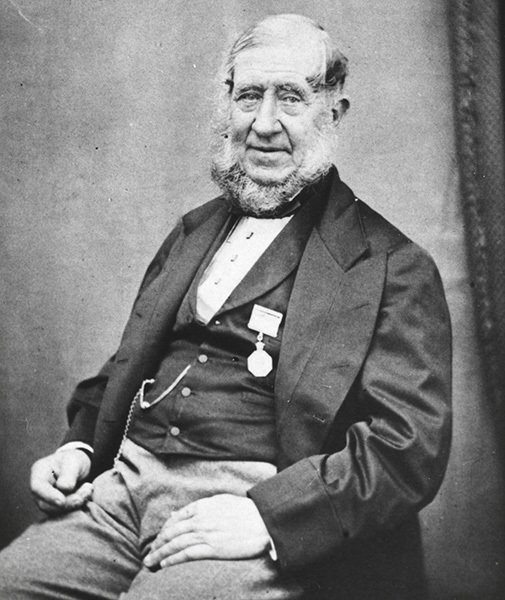 Canning Suffern grew up in Worcestershire and developed a keen interest in the natural history of his county, particularly in the area around Rubery, near Birmingham. As a boy he was an enthusiastic birdwatcher and throughout his life he kept detailed records of his observations. He began reading medicine at Cambridge in 1911 but his studies were interrupted by World War I, in which he served in the Royal Naval Volunteer Reserve, as a surgeon probationer. He completed his medical studies at St Thomas’s, London, and held posts in a number of hospitals before turning to medical journalism. He later joined the staff of The Lancet as a sub-editor. During World War II, he served as a controller (operations officer) in the RAF and from 1943-5 was stationed in India. His papers include reminiscences of his war-time service – ‘The log of a loblolly boy at sea, 1915-17′ about WWI – and several chapters on his time in India in WWII (MS 205 A523/1/1-2). Dr Suffern visited Titchfield Haven for the first time in 1921, while staying with his parents, who lived across the road at the site now occupied by Hill Head Sailing Club. His studies in natural history switched to Hampshire and his ornithological work around Titchfield Haven acted as a catalyst for further collaborative study after World War II. It was shortly after the war that he began taking parties of birdwatchers around the marshes at the Haven with the permission of the owner, Colonel Alston. Throughout his life he worked to encourage an interest in ornithology, particularly among young people, teaching them not only to identify birds and other wildlife but to accurately record their sightings. Under his guidance, birdwatchers produced the records which highlighted the Haven’s importance as a wetland habit for birds. This data helped lead to the declaration of over three hundred acres of the Lower Meon Valley, including Titchfield Haven, as a Site of Special Scientific Interest (SSSI) in 1959. Dr Suffern’s research interests were wide. In Hampshire, in addition to birds, he observed and recorded dragonflies, butterflies, and moths, particularly at Hill Head, Fareham, and Titchfield Haven. 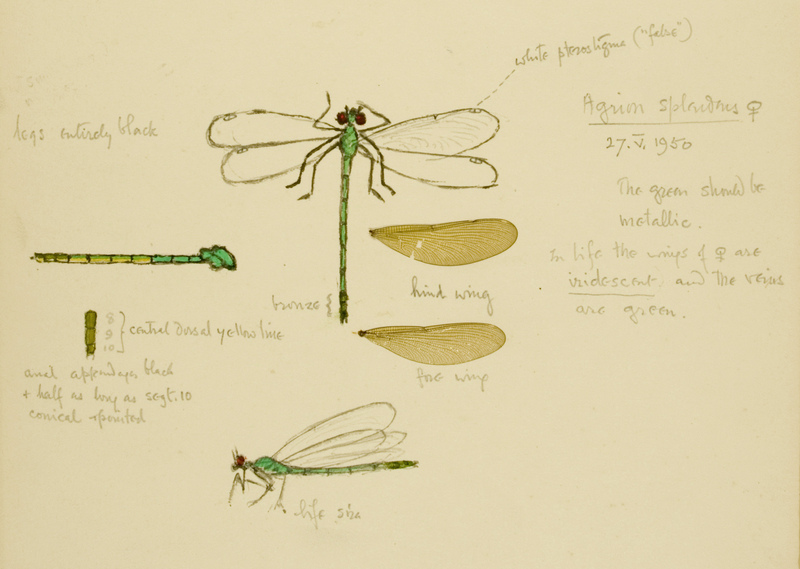 This drawing from Canning Suffern’s sketchbook of dragonflies is embellished with original dragonfly wings. It was part of his research into dragonflies at a pool at Hill Head in 1950. (MS 205 A517/3/4). His diaries are a working record of the weather, detailing sunshine, rainfall, type and density of cloud cover, and atmospheric pressure. In the summer of 1950, Suffern discovered a relationship between high pressure and the number of S. striolatum emerging at the pool — the peak occurred on 9 July, when he counted 417 in a single day. His research excited the interest of other naturalists and was published in one of the earliest volumes of the Entomologist’s Gazette. Dr Suffern’s papers include articles from natural history magazines and journals, and related notes; there are manuscripts of his literary works as a naturalist, as well as his reminiscences. 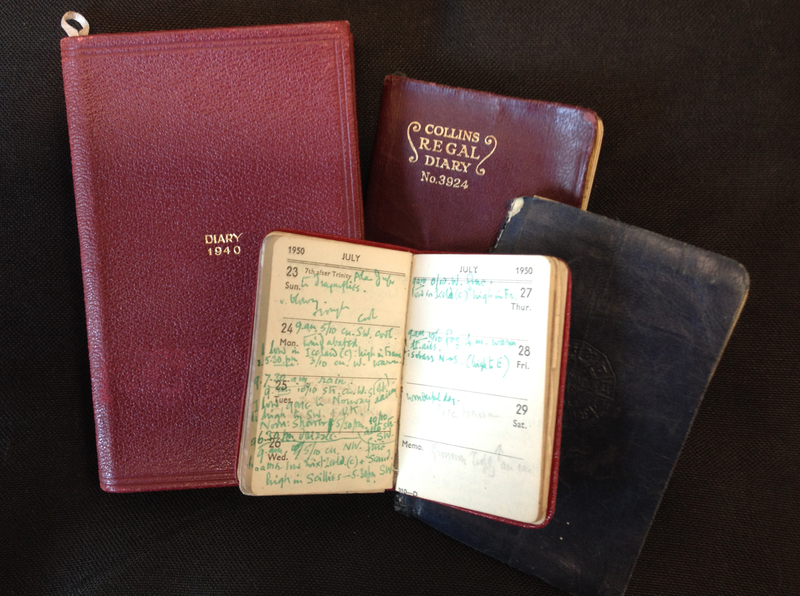 His significant ornithological archive – covering several decades of field work – forms part of the papers of the Hampshire Ornithological Society at the Hampshire Record Office, Winchester (HRO 75M94/C1), which also holds notes for his book The birds of Titchfield in relation to those of Hampshire and of Great Britain historically considered, or, A conspectus of birds mainly with reference to T H [Titchfield Haven]. To this day, Doc Suffern is fondly remembered at Titchfield Haven for his 50-year association with the nature reserve. During the 1960s, as an elected member of Fareham District Council, he fought for the future of the Haven. He lived to see the purchase of the estate by Hampshire County Council and the opening of the reserve for visits in 1975. The ‘Suffern Hide’ is named in his memory – a physical reminder of his life’s work. Canning Suffern’s research papers, MS 205, are freely available in Special Collections at the University of Southampton – a significant legacy for the natural history of Hampshire. 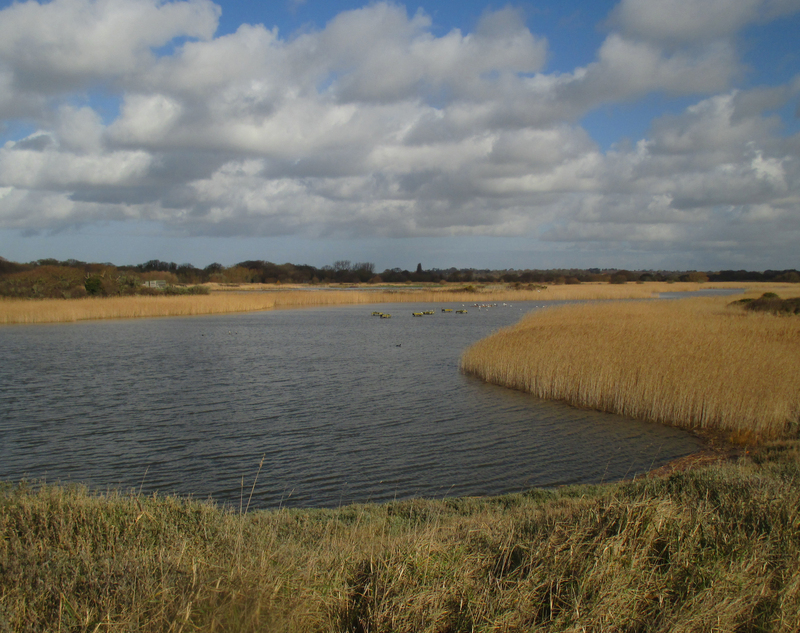 We acknowledge with grateful thanks the assistance of the staff and volunteers of the Titchfield Haven National Nature Reserve, and of the Hampshire Record Office. The photograph of Canning Suffern is courtesy of Dr Sue Dent and colleagues at Titchfield Haven. Any errors are those of the author. 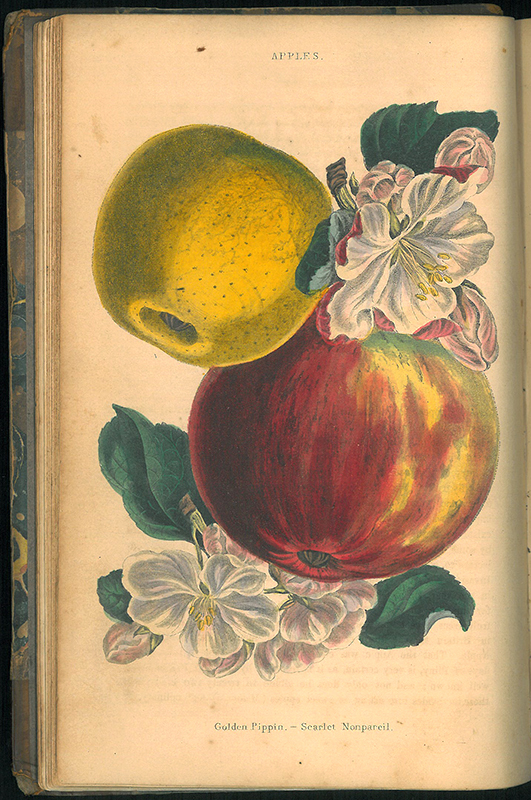 The botanist William Curtis (1746-1799) brought out the first issue of his Botanical Magazine in 1787. It was an immediate success with the ‘Ladies, Gentlemen and Gardeners’ for whom it was intended – there were over 3,000 subscribers. 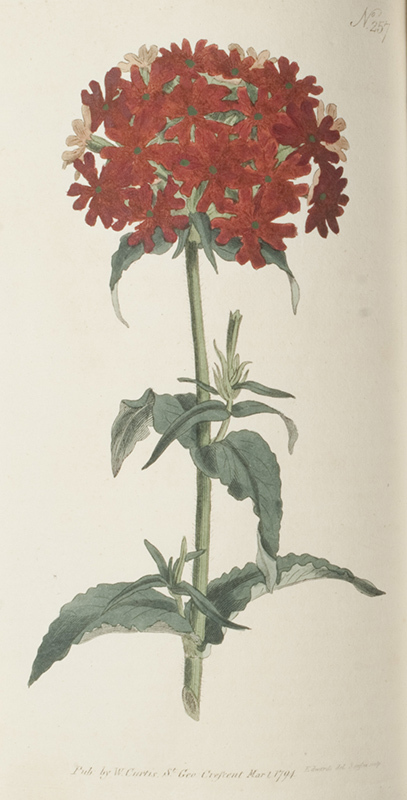 It tapped into the public passion for newly imported exotic plants – an essential feature of the fashionable garden – and much of its success was due to the beauty and scientific accuracy of the illustrations. 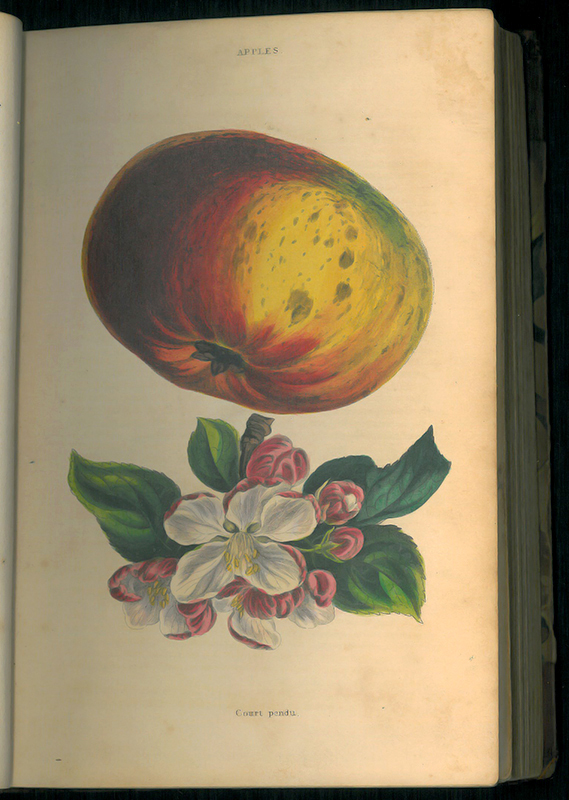 This volume was used by Althea Monck, who acquired it in 1909, to create a personal botanical record. The wood-engravings of the plants she observed have been hand-coloured with great delicacy and the date and location noted. 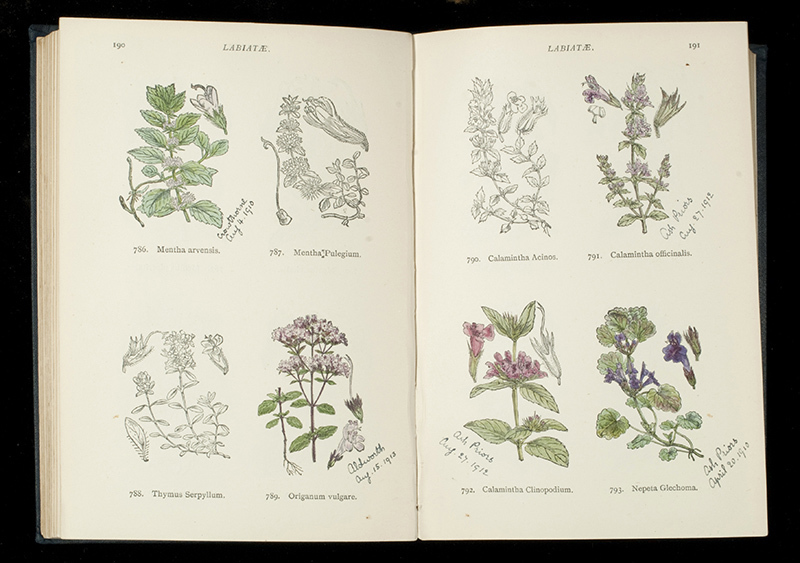 The plants identified on these pages were seen at Ash Priors in Somerset and Crowthorne in Berkshire. 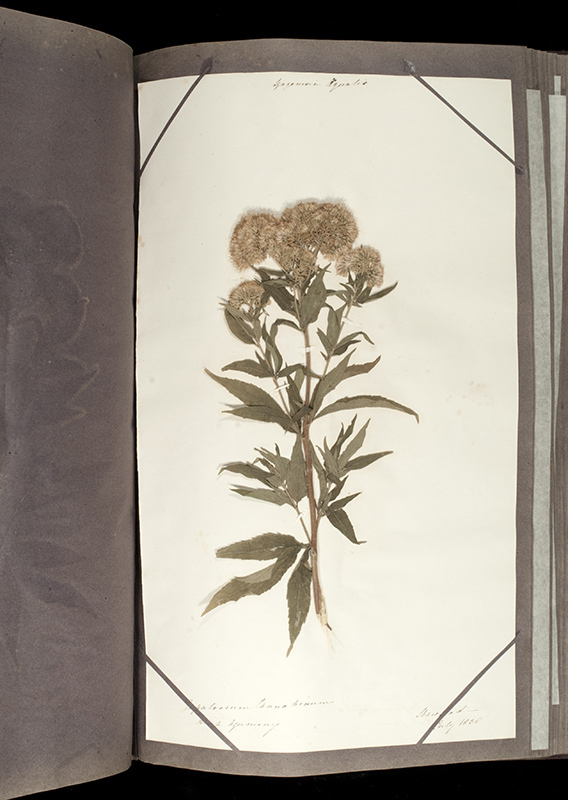 Hemp Agrimony, Eupatorium Cannabinum, collected at Shawford, near Winchester in July 1838, from vol. 7 of 8 volumes of a herbarium containing pressed flowers and plants collected and mounted by Emma Delmé Radcliffe, c.1837-52 MS 219 A819/7. This is an example of hemp, found at Shawford in Hampshire in 1838, from a 19th-century herbarium. 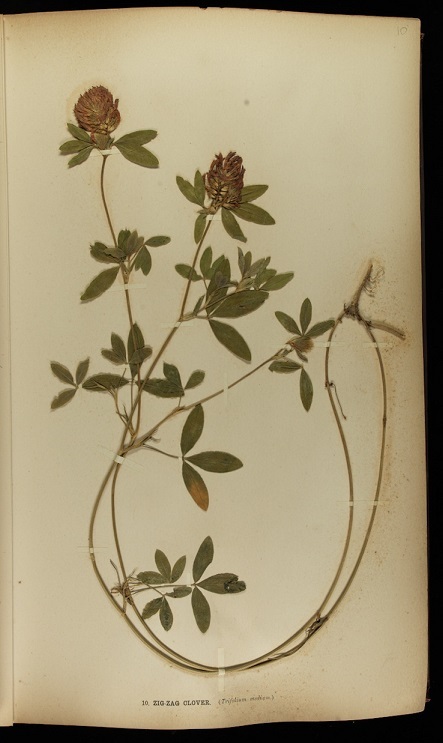 There are eight surviving volumes of this herbarium – from an original eleven – which contain 839 specimens of pressed flowers and plants, gathered principally between 1837 and 1840, mainly from Hampshire, the Isle of Wight and Hertfordshire, but with specimens from elsewhere in the south of England and occasional examples from Scotland and Ireland. 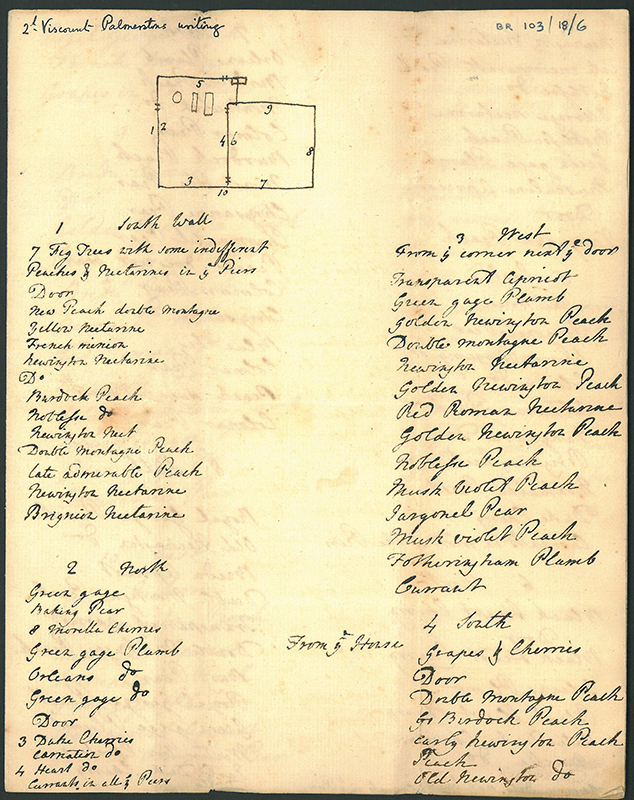 The volumes contain plants collected and mounted by Emma Delmé Radcliffe, née Waddington (?1811-1880), the daughter of John H.Waddington of Shawford House, near Winchester. In 1831 she married Frederick Peter Delmé Radcliffe of Hitchin Priory, Hertfordshire, which became her home – a sizeable minority of the specimens are from Hitchin and neighbourhood. Emma mounted these on single sheets of paper, giving their Linnaean class and order, their Latin names (according to the Natural system of classification) and common English names, together with a location and, in many cases, a date. The collection was arranged into volumes later in the nineteenth century, perhaps as late as the 1880s. While almost all of the specimens were gathered by Mrs Delmé Radcliffe, a few came from other herbaria: detailed research by the late Pete Selby (Recorder for south Hampshire) demonstrated that a few of the Isle of Wight specimens bore the initials of Miss Georgina Elizabeth Kilderbee (1798-1868), who lived at Cowes, and who “features in Flora Vectensis (Bromfield, 1856) as the most prolific contributor of localised records after the author himself.” It seems that Emma and Georgina were cousins and friends who worked closely together on their collections. 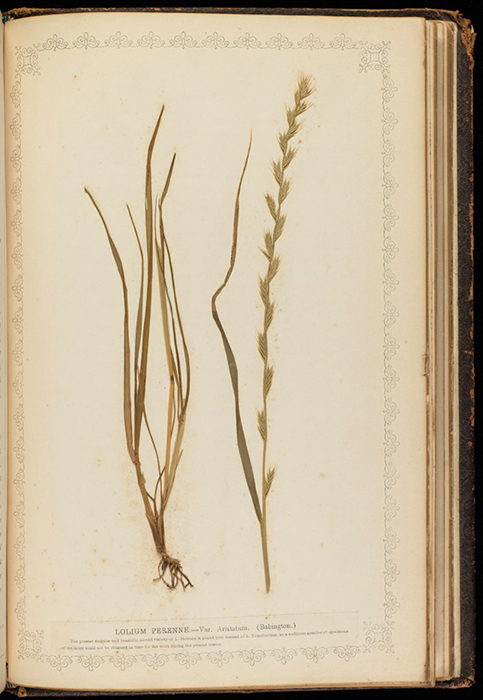 While there are references to a Kilderbee Herbarium – this has not survived – and so Emma’s herbarium gives a tantalising glimpse of her cousin’s work as well as a record of botany in Hampshire over 150 years ago. 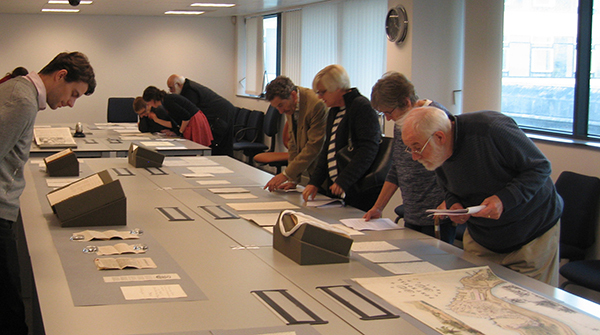 Next week we will be following the success of our Exploring the Wellington Archive afternoon with a free open afternoon enabling visitors to discover some of our lesser known delights. From 1530-1700 on Wednesday 18 November 2015, visitors will have the opportunity to view manuscript and printed material focusing on the theme of the natural world and to meet the curators. On display will be an array of material from across the collections, including on agriculture, botany, meteorology, environmental management and entomology. The visit to Special Collections will be followed by a short presentation on the Historic River Data and Freshwaters Archive titled Looking Back for the Future of the Worlds Rivers: “The use of historic data for predicting the future of river quality and ecology” by Terry Langford, Visiting Professor, Centre for Environmental Sciences. As November begins, winter arrives, and we wonder what the weather will bring this season: storm, gale and flood – frost and snow and fun?! This month as part of the Explore Your Archive campaign we will be exploring the earth and the natural world through our Special Collections. We cannot control the weather, but it rules our environment, affects our moods, safety, travel, communication, crops and health. No wonder man has tried to understand and predict it for centuries! Here in Special Collections we can trace this fascination – both scientific and popular – for natural phenomena, through monographs and private correspondence, scientific periodicals and encyclopaedias. The latter brought observations and explanations of the natural world to a wider audience. Descriptions of events such as meteors and great storms were popular, such as Daniel Defoe’s account of the ‘Late Dreadful Tempest’ of 26th November 1703 [published in 1713, Rare Books PR 3404]. 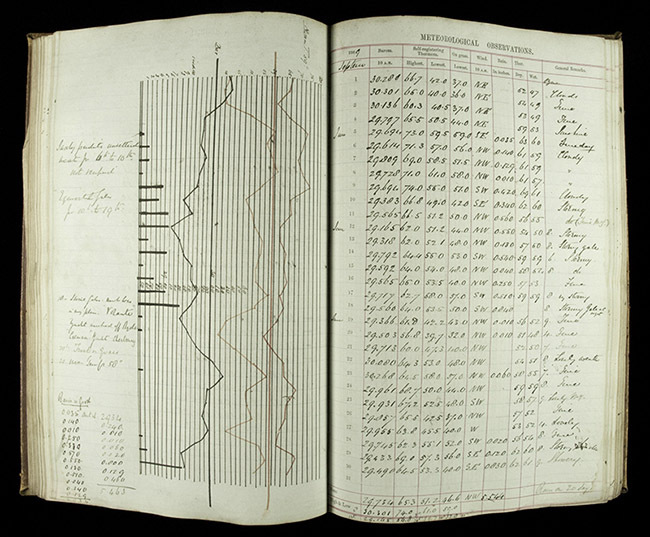 Incidental references to the weather appear in diaries and letters – there are many throughout the Wellington Papers [MS 61] and the Palmerston Papers [MS 62] – which contribute to a study of the weather over time. Archives have also been left behind by explorers and interested amateurs whose approach was more scientific. William Mogg of Woolston, Southampton, took part in survey expeditions to the Artic in HMS Hecla, in 1821-2, and HMS Fury, in 1824-5; abstracts from the ships’ meteorological journals and notes on environmental conditions during these journeys survive in our collections [MS 45 A0187]. 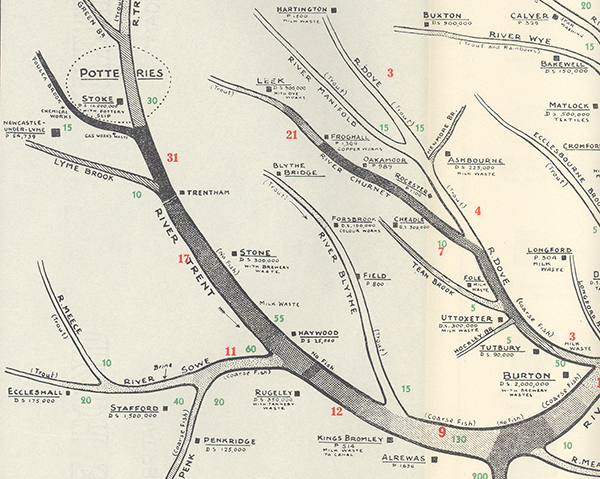 This is a fascinating record of our local environment 150 years ago. 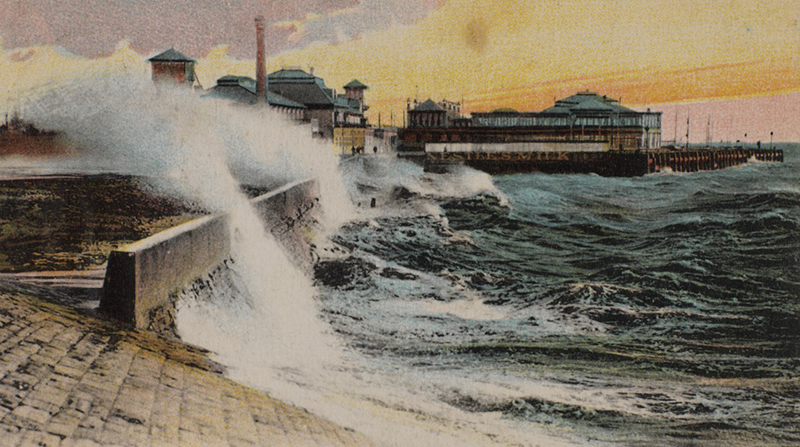 To mark Earth Day we have chosen to publish a piece from our upcoming newsletter on the Historical River Data Archive written by Terry Langford, Visiting Professor at the Centre for Environmental Sciences, Faculty of Engineering and the Environment. “On the day the photograph was taken in 2010, the river water was clear, showing waving water weeds on a clean gravel bed. Large numbers of brilliant blue Beautiful Demoiselle damsel-flies (Calopteryx splendens) were flitting over the water and landing on the marginal vegetation prior to mating. An impressive sight for any conservationist or ecologist. Standing on exactly the same spot almost 50 years previously I had seen a flow of black, foetid, fishless water with a layer of foam up to 1m thick in places. A hand-net sample of the river bed produced nothing but a Gordian knot of writhing bright red sludgeworms, the product of millions of gallons of poorly treated sewage and untreated industrial effluents from Birmingham, the Black Country and Stoke on Trent all many miles upstream. Biological diversity was virtually nil. The change over 50 years was almost unbelievable, but how had it come about and what were the processes involved? Although there were a few scientific papers from the 1950s and 60s, the processes of change had not been well described, mainly because there appeared to be no access to early data. However, as a result of some personal enquiries, a treasure trove of raw data was located, in the shed of one of the biologists who had worked on the rivers at that time. 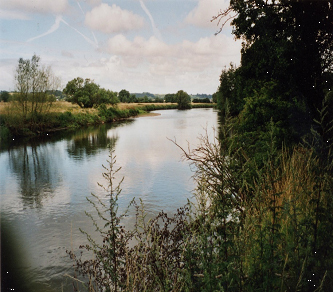 The hoard consisted of over 22,000 individual records of biological surveys in the River Trent Catchment all carefully organised in date order, plus reports and contemporaneous field notes. The material was retrieved very rapidly by staff in the Centre for Environmental Sciences. Thanks to their foresight and the willing and enthusiastic assistance of the staff at the University of Southampton Archives and Manuscripts, these raw data from biological and chemical surveys, which were about to be ditched by the Agencies, were saved from destruction and the individual records, the products of thousands of man-hours work, are now safely stored and catalogued for academic analysis, future management planning and future work by students. In addition, similar data for eastern rivers were sent to the archive by the Environment Agency in East Anglia, again some dating back to the late 1950s and early 1960s. These data form the longest run of raw river ecology data in the England and perhaps in Europe. Added to this are reports and grey literature that augment the story of the cleaning up of rivers in the English east and west midlands.